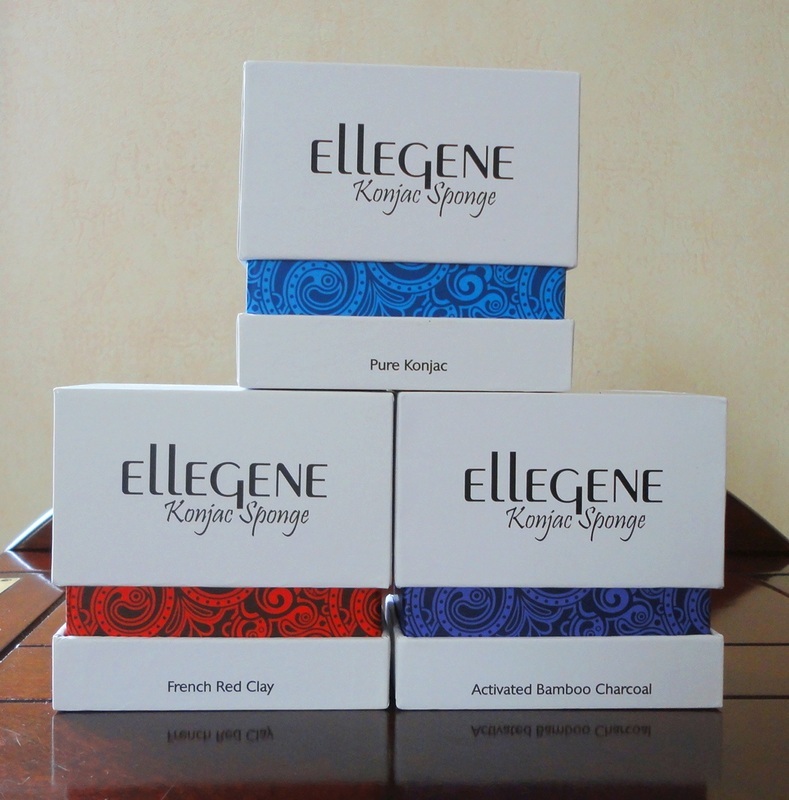 Since discovering Konjac sponges, I have scaled down my use of exfoliating gels to maybe twice a month. Considering that many less-than-natural ingredients are often found in face peeling formulations, this can only be a good thing. These sponges do the same thing (i.e. remove the topmost layer of dead cells from the surface of the skin) but much more gently and can be used every day. Kojac sponges are hard when dry, and need to be soaked in warm water to bring them to a soft and elastic state. You can then rub the sponge in circular motions all over your face, or use it to increase the action of a good gel cleanser before rinsing your face with warm water. That is my preference and my skin feels both clean and soft afterwards. They can be disinfected by boiling or microwaving and, since they are made of vegetable fibre, can be discarded with your biodegradables (compost bin) when they start to break apart. Red Clay – new to me, this type of sponge is indicated for mature and sensitive skin because it helps improve areas damaged by sun and age. Generally I use the white one in the morning, the red one at night and the black one about twice a week, as it has a deeper, more specific anti-acne action that I need less these days. After this gentle but effective shedding of old cells, skin is more receptive to the expensive hydrating and nourishing creams that are needed to keep my face in as good shape as can be expected at my age. I have also used the black sponge to prepare my legs for a self tanning lotion and I know it did a superb job because the next time I applied the self tanner, I did not bother to exfoliate, and the results were not nearly as even as the first time. 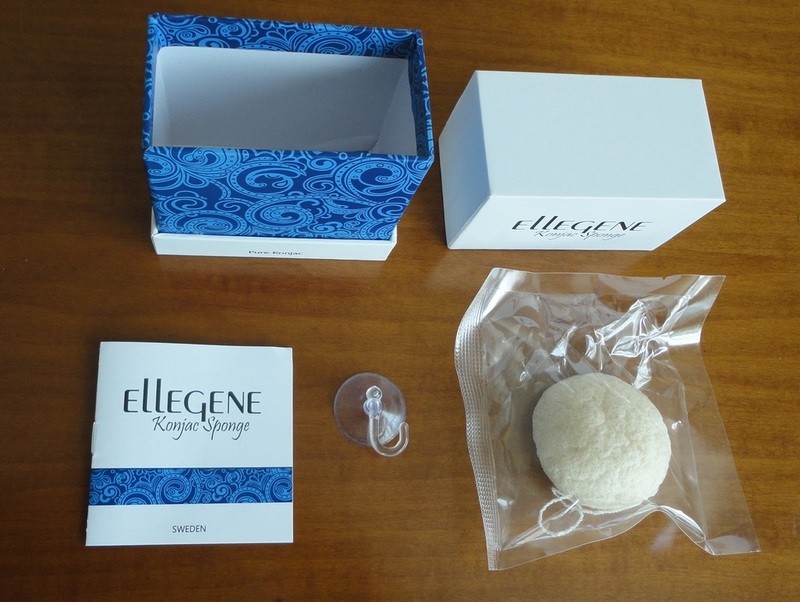 The Ellegene sponges are a little larger than some others I have tried, and have a little string embedded so they can be hung to air dry in between uses. 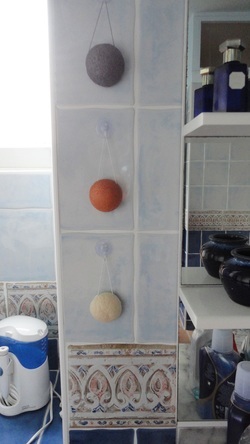 I was delighted to find a dainty suction cup in the box that clings easily to the tiles in my bathroom. A small but thoughtful touch. The whole presentation is excellent. The sponges arrive in a beautiful printed box, colour coded to the type of sponge and with a very informative booklet. After using them regularly for several weeks, they have become a pleasurable ritual that saves me time and money by increasing the action of any cream that follows. 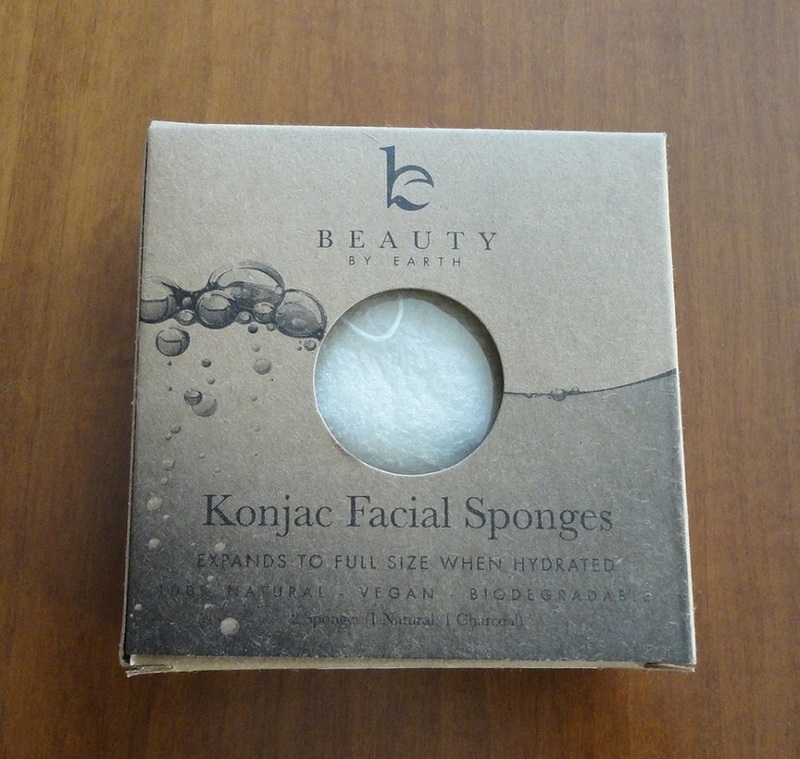 Exfoliating regularly becomes a habit because these Konjac sponges make the process so easy and so pleasant. Rotating among several seems to keep them in great shape, and they still look and feel like new, so I expect them to last well over the estimated 2-3 months. 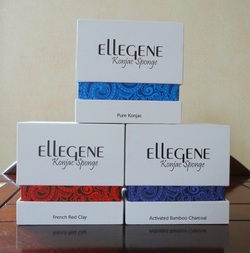 Ellegene is committed to natural products and does not test on animals. I have tried dozens of exfoliating creams and gels over the years, and some are really unpleasant to use. It feels like my fingerprints are being erased! I understand the importance of shedding dead skin cells, especially as my skin ages, because all those expensive creams we are trying to pump into our wrinkles are not getting a chance to penetrate. So I was very interested to try these little sponges, although I was surprised to see how small they are. After using them for about a month, I can say that I have no more excuse for not exfoliating regularly because these Konjac sponges make the process so easy and so pleasant. 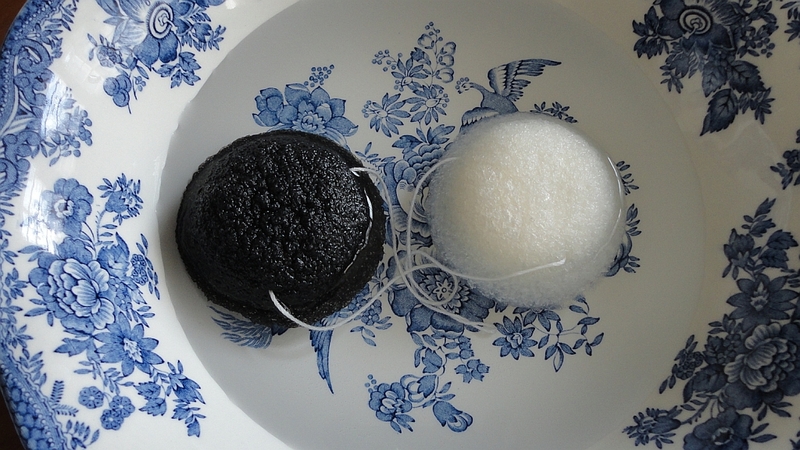 There are two sponges in the packet: the white one is softer and suitable for all types of skin; the black one is more specific for problem skin (i.e. acne), and generally speaking, it allows a deeper sloughing off. I have used it very satisfactorily to prepare my legs for a self tanning lotion. I know the sponge did a superb job because the next time I applied the self tanner, I did not bother to exfoliate, and the results were not quite as smooth as the first time. They can be disinfected by boiling (once per week, if you use them daily) and, since they are made of vegetable fibre, can be discarded with your biodegradables (compost bin) when they start to break apart. 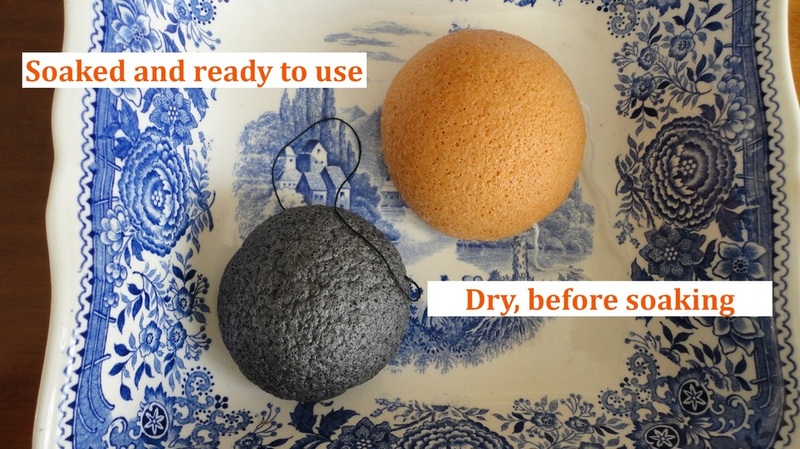 The sponges should be allowed to dry naturally after each use, returning to a hard state. A short soak restores suppleness and they are ready to be used. I like the way they foam up gel cleansers, adding to their usefulness, and my skin feels both clean and soft afterwards.